Grundfos is one of the world’s leading pump manufacturers, with an annual production of 16 million pumps, and one of the first clients of Develco. Grundfos approached Develco about development of a concept to control their pumps of the future. What they had in mind was a mobile toolbox for professional users of their pumps. The toolbox should provide access to control of the pump, reporting and data collection. The new pump controller should be hand-held and easy and intuitive to use. This development task was outside Grundfos’ core competences, as the toolbox would be a kind of accessory to go with their core products. Another challenge was the deadline. The launch of two new product series was only seven months away, and they could not be launched without the mobile toolbox. Develco therefore had to make its project management very tight. Develco developed a unit capable of communicating via radio technology as well as infrared communication. Develco was in charge of the project management. Physically, development took place at Develco’s premises and in a handpicked team dedicated to this specific task, consisting of Develco’s own engineers and external partners. We made a hardware add-on in two different versions, suitable for Apple devices and for units based on Android. The unit communicates via iAP/iAP2 and is plugged directly into an iPhone, iPod touch or iPad. We also developed a separate portable hardware that can communicate via Bluetooth with both iOS products and Android units. 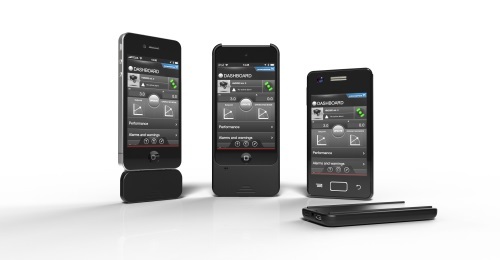 The app “Grundfos GO Remote” can be downloaded for free for iOS and Android. The product was developed on time and in close cooperation with the customers and other partners. One obvious benefit was that Grundfos managed to launch their two new product series as planned. 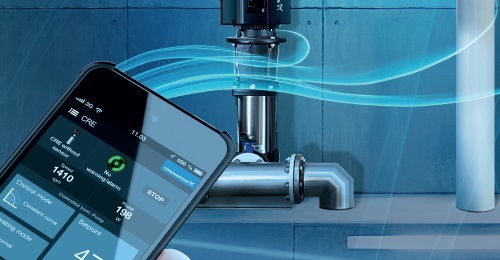 Another benefit is that Grundfos now has the most comprehensive mobile platform on the market for control, management and monitoring of their pumps. The solution developed is flexible, communication is easy, fast and efficient. In addition, it can provide guidance and advice as well as send real-time pump data to the user of the system.